Italy/US, 1966, 102 minutes, Colour. Peter Sellers, Britt Ekland. Victor Mature, Lilia Brazzi, Paolo Stoppa, Akim Tamiroff, Martin Balsam. 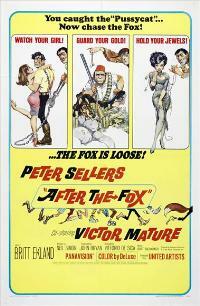 After The Fox has excellent ingredients for a popular comedy. However, it is only a moderate success. Perhaps the international blend of artistry did not entirely mesh. Directed by the expert Vittorio de Sica, it does not measure up either to his popular Italian films or his more penetrating looks into human nature and society. However, he was having an enjoyable time directed Peter Sellers with his then wife Britt Ekland. It is a comic gangster film and gives an opportunity for Victor Mature to parody his screen image. The material was written by the very popular Neil Simon. In the '60s his material was most successful on Broadway e.g. Barefoot in the Park. He was to make his mark in the '70s with screen versions of so many of his plays, also with his original screenplays. The film is certainly of interest for the fine ingredients which went into it plus Burt Bacharach's catchy music. It is a pity that it is not an unqualified success. 1. The main qualities of this comedy? Its success? 2. The characteristics of a Peter Sellers comedy: his identity, use of disguises, the aspects of his bungling, ultimate success? What kind of persona is the Peter Sellers character? 3. The significance and indications of the title? The humour of the credit sequences? The song and its lyrics for the theme? The impact of the initial robbery and its comic simplicity? 4. The characteristics of the film's style: the Italian atmosphere, the robbery atmosphere. the film world and film style? How well did these blend? 5. The importance of the introduction: Interpol. the three criminals and their humour, the contrast with the Fox? 6. The ingenuity of the Fox's escape and its later use? The visualising of the Fox thinking, his improvising? The humour of the film from these aspects? 7. The portrayal of the Fox with his companions? Their foolishness? The two detectives continually following? The weaving of these themes through the film? 8. The Fox as an Italian son and brother? The confrontations with his mother and her disowning him? Her emotional lamenting? The protection of Gena? Family loyalty? His disguises and intervention during the filming? 9. The satire on Tony Powell? The detailed presentation of the faded star? His pretences? His relying on his agent. the agent's exasperation. his knowledge of the truth? How convincing was this satire? 10. The Fox's convincing Powell to participate in the film, without any facts. A tour de force of pretence? All the jargon of the film world? The phone calls to Sophia etc.? The humour for the plot, the satire on the film world? 11. The humorous presentation of the town, the satire on the townsfolk? The people wanting to be in a film.. the policeman and his ‘good morning', the mayor ? all helping with the gold? 12. The satire in the filming: the beach scene, the communication and noncommunicating, the symbolic running away from oneself etc.? How accurate were the digs at contemporary filmmaking? 13. The appearance of Ochra and the girl? Ochra's speaking through the girl, animal etc.? 14. How successful was the slapstick chase and crash at the end? Appropriate for this film? 15. The court sequence, the film and the man calling it a masterpiece? 16. How effective the blending of satire, comedy, comedy of human nature?